Students at Coe Hill School collected 632 non-perishable food items for the Coe Hill Food Bank. 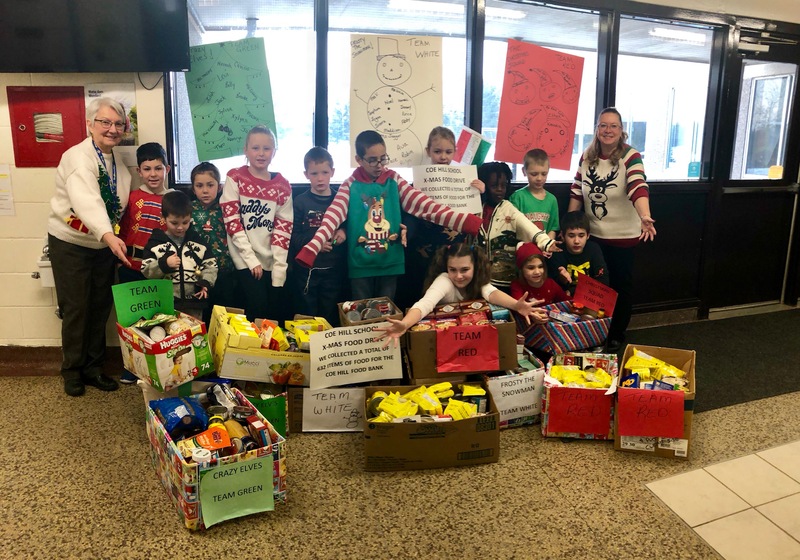 December 21, 2018—Students and staff at Coe Hill School are caring citizens who consider the needs of others and want to make a positive difference in their community. This year the annual food drive took a twist: All students and staff were divided into three teams. The White team of Frosty the Snowman, the Green Team called The Crazy Elves and the Red Team called The Christmas Squad. The goal was to collect the most food items, with a pizza party for the winning team. The food drive started on December 3 and ended December 18, 2018. During that time, as the boxes filled with non-perishable food items, students would excitedly check their team’s bin to see which team was in the lead. When the 200-mark was reached, everyone was thrilled and a new goal of 400 items was announced. By the last day, the final count was 632 items. The community was in awe that this little school with 46 students and 9 staff could collect that much food. All 632 items were delivered by staff and students to the Coe Hill Food Bank on Wednesday, December 19, where volunteers were overwhelmed and grateful for this wonderful donation.